Forest River Flagstaff Shamrock Expandable Review: Amenities Galore! To know the top features of our Forest River RV Flagstaff Flagstaff Shamrock Expandable for sale that we think are fantastic, take a look at this Forest River Flagstaff Shamrock Expandable Review and you’ll never want to go back to a sleeping in a tent again! 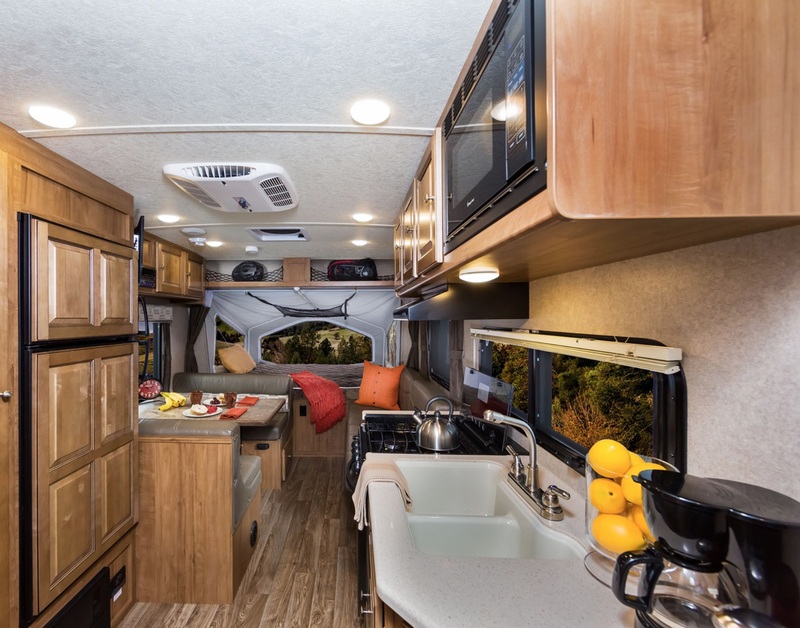 If you’re a camper just starting out, this could also be a great option for you and your family, as it’s lightweight and spacious– somewhere between a tent and travel trailer. The Shamrock is designed for the family. Its high quality interior and exterior designs give it a level of sophistication, equaling the level of comfort and space. The combination of quality and comfort meet in the middle, creating the greatest space fit for a family, a space that will last for a very long time! The best part of the exterior of this expandable is the lightweight durability! You’ll be able to easily tow it with a smaller vehicle, which means you won’t have to buy a truck just to get a camper if you don’t have one! The beautiful driftwood interior (optional maple) against the decorative slide out fascia and solid wood and raised panel doors and drawers. The wood cabinetry give it a warm atmosphere that you’ll love. Whether it’s summer or winter, you’ll be able to enjoy the ducted furnace in the chilly nights, the 13,500 BTU ducted air during warmer nights, or even upgrade with the option of a 15,000 BTU A/C for hot summer days. While we love the outdoors as much as anyone, it is always nice to have other entertainment in case of cold, rainy weather. Because of this, the Shamrock provides a mounted 24″(or 32″) LCD TV (optional bedroom mounted 24” LCD TV in select models). Your family will have plenty of space with a family dinette to play games on in the evening, and you will be able to enjoy sleeping on a heated mattress afterwards. Get Out on the Go! If you have any questions about this awesome expandable that will allow you to camp wherever you are, please contact us today! We’ll hopefully be able to answer as many questions as you have. If you’re wanting to come and look our Forest River RV Flagstaff Flagstaff Shamrock Expandable for sale please stop by!